RECEIVED THE HIGHEST RATING FROM A CONSUMER MAGAZINE FOR A GUTTER GUARD SYSTEM. New Roof & Gutter Topper! 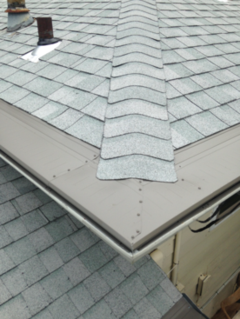 "The Leaf Terminator" over 5" Gutters & under Laminated Shingle. Welcome to Gutter Topper of KC! We are Celebrating our 15-Year Anniversary in Kansas City! 2017, 2016, 2015 and 2014 Angie's List Super Service Awards! Gutter Topper® of KC has served over 7,500 Kansas City metro homeowners since 2004. We are a local family owned Gutter Topper dealer promoting Top Quality gutter protection products manufactured by a family owned manufacturer located here in the good o'l USA! 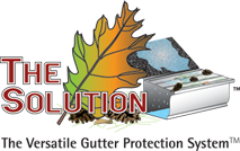 Lots of wonderful folks around Kansas City have Gutter Topper® protecting their gutters...and their gutters help protect their home. Kansas City is our home. A Good Name at the end of the day is very important to us. 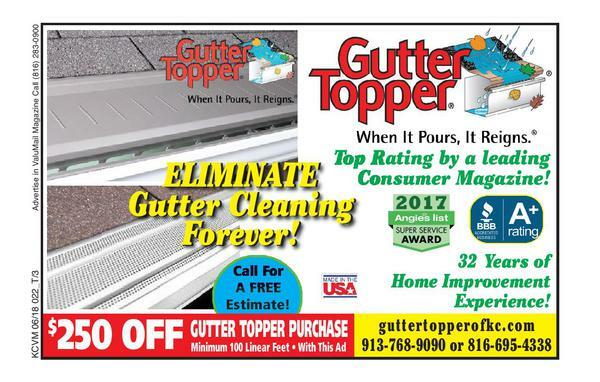 We know there are other good companies in Kansas City that offer good products, but we believe our Top Rated Gutter Topper® with its Manufacturer Lifetime Transferable Warranty, our Seasoned Craftsmen and our Competitive Price create the Best Value for our Customers! BEAUTIFUL - Choose the perfect color to enhance your home. Matches your existing roof and/or gutter color. Blends with the contour of your roof line. Enhances the curb appealof your home. Increases the value of your home. SAFE - Protect your family from falling and personal injury. 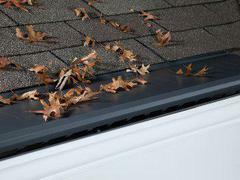 Eliminate the danger of cleaning gutters. Protect your foundation and basement from gutter overflow. 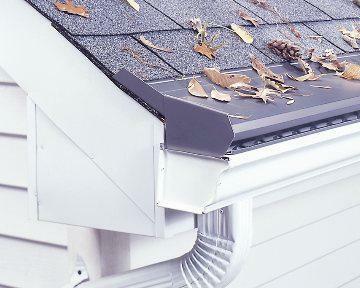 Keeps birds out of your gutter with patented Bird Guard system. STRONG - Independently tested and certified to assure proven performance. Debris tested - stops leaves, twigs and debris. Certified to resist winds of 110 mph. Handles downpours of up to 22" per hour. Weight - withstands up to 1200 lbs of snow load per sq. ft. Handles ice easily with unique Ice Release system. Enhances the overal strength of your gutter system. "Nothing stopped Gutter Topper from performing as it was supposed to." Custom Inside Pan Miter Eliminates Splash Guard! Gutter Topper of Kansas City serves the entire KC metro area as well as Eastern Kansas and Western Missouri.